Several organizations staged a protest Thursday to affirm their right to peacefully protest on campus. 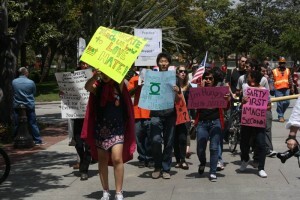 The “Day of Peace and Action” was primarily organized by the Social Justice League, a group of students who want to express their right to free speech on campus, but involved representatives from the Student Coalition Against Labor Exploitation, the National Union of Healthcare Workers, the Coalition for a Safer Campus and Community, Call for Justice, Students for Asian Women Empowerment, the “Local 4” chapter of the Brickbuilder’s Union, Take Back the Night, the Nisei Project, the International Socialists Organization and She Shall Go Free. Onlookers were not clear what the protesters’ intended message was. Katie Morris, a sophomore majoring cinematic arts – critical studies, said she didn’t understand what the group was marching for. After marching, the protesters gathered in front of Tommy Trojan. Ashley Wabara, an undeclared freshman, said she came to the rally as a representative for Campus and Community United, which works to ensure the interests of the surrounding community are considered during relevant administrative decisions. Michael Torres, a respiratory therapist at the USC University Hospital, said he marched to support several university-related unions. Some students who observed the protest came closer to listen to the speakers, although most people walking along Trousdale did not stop. Tim McGuingan, a senior majoring in public policy, management and planning, said he was glad to see students exercising their free speech, even though their message was not completely clear. Dear Actually, You are actually wrong. 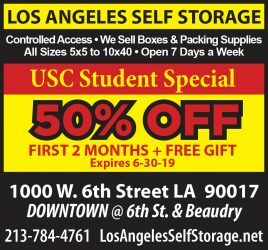 USC has excellent policies. You are simply trying to get us students involved in your labor issues so you can get more attention. They are not linked. All that will happen with your raises is that tuition will go up even further. 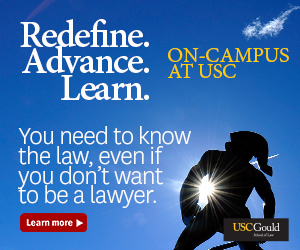 No, our sexual assault and sexual harassment policies are sh*t. And the way that USC typically handles sexual assault/harassment is despicable. Our standards are disgustingly low, especially compared to other leading universities. The demonstration was focused on several important but related issues. Many of the groups are focused on the complete lack of worker’s rights at USC, the injustices committed against the surrounding community (gentrification, denying jobs to a population filled with skilled workers, cutting hours and wages, etc. ), and related issues. There were also several groups who have been working on addressing issues of sexual harassment, sexual assault, and reforming the USC policies on these issues (as they are terribly inadequate). 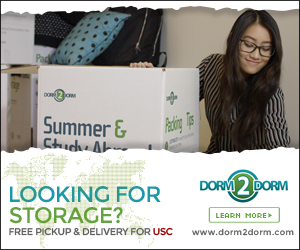 And there were several groups that want USC to stop relying on corporations that use sweatshop labor to produce our university apparel and labor exploitation to provide food for our dining halls. We delivered a packet to the administration with details about each of the groups and what we are wanting to University to address. The demonstration was also in response to intimidation tactics by DPS and other university officials against a number of students and groups who are active in the community. It was an opportunity for all of us to come together and support each other. Protesting for the sake of protesting is a waste of time. Why aren’t you protesting about the lack of quality job development in this country, congressional overspending, illegal immigration that’s out of control, the US involvement in 3 theaters of war, etc?